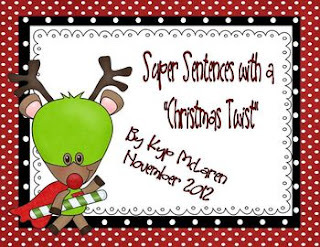 To help my students learn to expand sentences in writing we begin with a graphic organizer called Super Sentences. We begin by making a list of characters (perfect time to try this is around a holiday, but could be done any time of the year). After making a list of characters each child chooses one and then describes the character in the describe box on the graphic organizer. They continue filling in the graphic organizer moving across the page to the right. After filling in the organizer I have them write their sentences or stories on the super sentence paper.